It doesn't take a genius to realize that the male voice and the female voice are different, and whether you're a choral singer or a jazz soloist, the lessons here are aimed at your voice. We've got books for tenors, baritones & basses, parts tapes for all the above, secrets, techniques and even a vocal first aid kit. And not only do we have instructional books, we have sheet music aimed directly at your voice type. This book/CD pack by veteran vocal coach Lis Lewis (Steve Miller, Herbie Hancock, Bobby McFerrin, Gwen Stefani) will help singers of all styles of music: warm up their voices, increase their endurance and range, correct bad habits, and sing longer and better! It is divided into two sections: The Singer's Troubleshooting Guide covers vocal health, finding the right teacher, practice, auditions, rehearsing, recording and performing, and The Singer's Warm-Up CD features helpful exercises to prepare the voice for serious singing. Tried and proven by known industry professionals, Bob Rose's method for men and women will show you how to vitally improve your singing performance in all styles of music. These book/CD packs include live singing sessions demonstrating specialized techniques, and warm-up exercises to stretch, align and build your vocal instrument. They are designed to aid you in releasing, directing and controlling your singing, eliminating your problems and replacing them with working solutions. 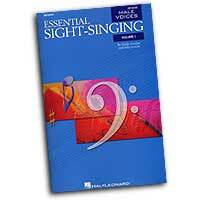 Based on the successful Essential Elements for Choir series, this new choral sight-singing method will allow you to build skills in all your choral ensembles in a handy octavo-sized volume! Featuring a step-by-step approach, unison and combinable exercises, and motivating short songs, these volumes provide a basis for developing music literacy within the choral rehearsal, allowing your singers to develop their full individual potential. 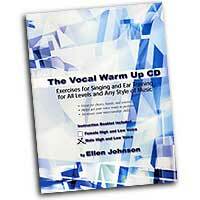 The Vocal Warm UP CD is a great way to improve your singing skills and ear training abilities! 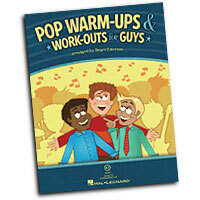 The CD has seventeen vocal exercises designed to give you the mamimum warm up for your voice range. The CD's are divided into Male and Female low and high voice versions with an ear training section that follows. There is a book that explains all of the exercises and each exercise is demonstrated by a singer on the CD so it is easy to use. Once you hear the exercise you will be accompanied by piano to sing along with the CD. The CD was compiled by Ellen Johnson, a professional singer of many musical generes who has been teaching for over twenty years. She holds a Masters degree in Vocal Performance and has been a Professor of Voice at universities and colleges as well as teaching for the Old Globe Theater's M.F.A. program. She currently resides in the Los Angeles area where she has her own private studio and gives workshops and classes. "Use of this warm up tape done correctly over a period of time will result in better vocal production, strength, and coordination of muscles. Many of my professional students use this tape prior to their performances. The ear training part of the CD is to help you develop better pitch and recognition of notes and patterns. You will find that your musicianship skills will increase over time by listening to the exercises and identifying what you are singing." Unchanged, changing or changed male singers in middle school and high school may need a little extra help in “finding” their singing voices. Roger Emerson has developed a series of warm-ups that uses excerpts from classic rock and roll tunes that will provide the motivation and repetition they need to do just that. Each song features limited ranges starting moderately and gradually ascending into the tenor range and descending through the bass range as needed. The professionally-produced CD recording presents each exercise with vocals so your guys have a model to emulate. A complete step-by-step guide, "Secrets of Singing" provides everything needed to gain technical and musical vocal mastery. Some of the highlights include: Basic principles of singing, mastery of the upper voice, achieving the power of an open throat, and phrasing and diction on a professional level. 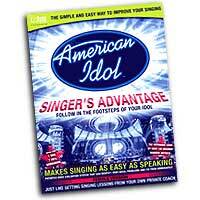 Jeff has developed a hard-hitting vocal method designed to bring out the unique qualities in any singer's voice. Through his process of technique and performance analysis, he has fine-tuned the voices of thousands of solo artists and bands now performing and/or recording throughout the musical world. Jeff's experience as a coach, band consultant, and producer allows him special insights into the problems of singers at all levels. Whether you're singing for pleasure or for profit, "Secrets of Singing" will give you the know-how to practice, audition, perform and record professionally.The package contains two CDs (one for high voice and one for low voice) and an almost 400-page information-packed book.